This topic contains 77 replies, has 15 voices, and was last updated by Alfredo_T 1 year, 10 months ago. This transformer is from the WLW 500kW 1930s vintage transmitter. The guy in front of the transformer is 6′ tall. 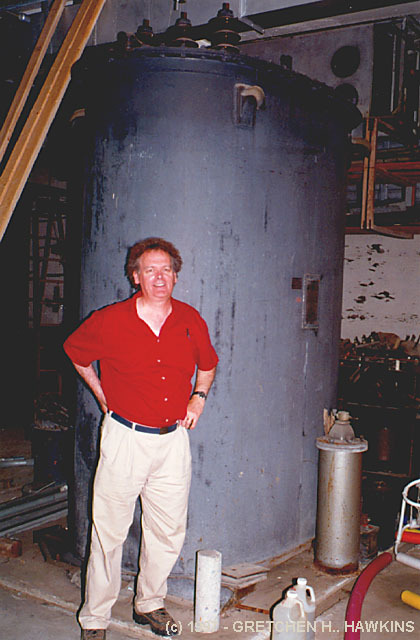 This transformer was filled with 725 gallons of oil and weighed 35,700 lbs. Back then, you could say and claim to be anything you wanted. Didn’t make it true, but stations made all kinds of claims. Back then, most STL’s were via telco and there were “grades” of service. The cheapest was a twisted pair. Then an equalized line to 5kHz, which was the norm. A few of the bigger stations would get equalized lines to 8500 Hz or 10kHz. Most stations, and all network lines, were equalized to 5kHz. If a station had their studio and transmitter at the same site, they could have better response, and some did. High level modulation transformers on low power transmitters were not as big as the one in Alfredo’s 500kw picture. This was a 1KW transmitter. Most transmitters of that size had the modulation transformer inside the transmitter cabinet. They could say they were HIFI which meant they were a little better than the rest. Plus, playing the new hi-fi records of the time. It didn’t mean what it means today. I beg to differ that the AM radios of the 50’s were not very good. Many weren’t but those older ones sounded better than most of the radios of the last 30 years. At least on AM. When FM became the leader for music, they quit making good AM tuners. They also limit the response on the transmitters. KGW had great sound on that old Raytheon transmitter they were using back in the 50’s. Before they moved in with tv, they did their broadcasting from the transmitter site and fed the output of the console directly into the transmitter in the next room. Not all stations did that though. When KVAN was at Jantzen Beach, the console was in the same room as the transmitter and they did not have good sound out of that old Collins board and transmitter. Same with KISN when they were from the transmitter. The quality of the sound was not good but teens did not care. It was about the music, not the quality. If you wanted quality, you would listen to KEX or KGW. These were all done with tubed radios and broadcast equipment. Transistors had not maded their way to radios, yet. They could say they were HIFI which meant they were a little better than the rest. Plus, playing the new hi-fi records of the time. Come to think of it, for a station to claim that they were “hi-fi” because they played the new “hi-fi” microgroove records is not that different from stations in the early 1990s that claimed they were “digital” because they played CDs. I am still interested in what “hi-fi” meant in KHFS’s context. Did their custom-built transmitter have lower distortion and a wider frequency response than the 1kW transmitters that RCA, Gates, et al were making back then? On a somewhat related note, at the Puyallup hamfest, I picked up a Hickock swept-frequency alignment generator intended for broadcast-band receivers. It generates output on either 455 or 1000 kHz. The maximum deviation is on the order of +/-15 kHz. I haven’t fired it up yet, and I was told that it might need some work (such as the replacement of dead electrolytic capacitors). So, there were some AM tuners back then that needed more than the single-frequency (tune for maximum response at 455 kHz) IF alignment. I suspect that these high-fidelity tuners were niche-market items, though. Other audio features of the Philharmonic were a 10-kHz audio notch filter, a40-watt class-A power amp employing push-pull output devices, and a two-way speaker system employing a 15-in. woofer and two five-in. tweeters. High Fideltiy for AM is kind of what happened when a few US. FM stations claimed that they could broadcast in Quadraphonic stereo. Just like the one in Lake Oswego we all knew/know and love. KHFS was LONG before the L.O. Quadraphonic stereo station. An analog radio could be tuned offset a bit to pick up higher frequencies. Here is a 1957 aircheck of a station that touted itself as “high fidelity.” The station was Minneapolis-St. Paul KSTP. I am not sure whether this recording was made off the air or off the modulation monitor. The trade off being an increase in distortion and low end loss. AM tuners (most of them) just don’t pass “high fidelity” aural bandwidth. If you stop and think about it, what would be the result of a tuner allowing extra bandwidth for AM detection? It’s called adjacent channel interference. Just because the next slot up the dial is hundreds of miles away does not make the tuner immune from such interference, especially if the sensitivity of the radio front end is decent. Loosen up the selectivity (ability to reject off frequency signals) and you will be bombarded with ACI. All the marketing hype, good intentions, and possible increases in the transmitted signal just don’t mean squat. Any modification to a transmitting device requires type acceptance and type approval. Pre-solid state exciters and transmitters were built knowing the limits of the typical receiver. The KSTP-AM aircheck sounds fairly “bright” but high fidelity ?. The “hum” when the microphone was on pretty much ruins that claim for me. Here is an ad showing the “high fidelity” 1957 Webcor “Musicale Coronet” that they advertised in the aircheck. It is the small player, bottom right in the ad… high fidelity? Anybody guess what year ‘vette is shown at the top of that page? I found it somewhat disappointing that KSTP, despite spending big bucks on their new Ampliphase transmitter, couldn’t figure out how to fix something simple like that hum on the microphone channel. I thought the musical selections sounded pretty good though, and I was impressed by the overall lack of distortion. What I wondered when I heard the advertisement for the Coronet was whether this turntable used a ceramic or a magnetic pickup. That question remains unanswered. Wow! I didn’t believe it, but this looks pretty real. The little red knob on the top of the tone arm is a pretty sure sign that a GE vr2 is lurking underneath. Most packaged audio systems from the era (even Zenith, Packard-Bell, Magnavox) used ceramic cartridges. No doubt about it… look at the tone arm in this picture!